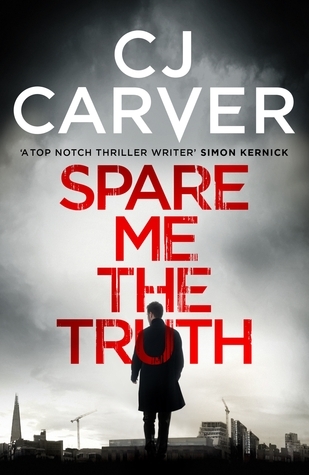 I’m delighted to welcome CJ Carver, author of the fantastic Spare Me The Truth (review up soon! ), to my blog today. Without further ado, over to CJ! 1. Tell me about ‘Spare Me The Truth’. I’ve always liked looking into the future and seeing what science is up to, because a lot of what seems like sci-fi today can be reality tomorrow, like test-tube babies, cloning, and growing potatoes on Mars which NASA really are trying to do. I like writing high-concept thrillers where the stakes are high as well as thought provoking. I think it’s the word “secret” that drew me to write about the spying world. Anything undercover or hidden to me is immediately fascinating. As a child I’d pretend I was a spy. I found the idea of knowing something while everyone around me was oblivious, incredibly powerful. Writing about espionage means I’m telling a story with high stakes, because the consequences if you get caught ranges from being fired from your job to being executed. It’s a terrifying place. Also, I’m a very open, straight-talking person and I find writing about people who are nothing like me – wily, shrewd and duplicitous – very stimulating. 3. Which was your favourite character to write? What a question! I love Dan as he’s nothing like me, and I also love Lucy for the same reason. Dan is taciturn and aloof while I’m neither. Lucy has a terrific temper on her that I admire immensely – I wish I had the courage to let rip like she does. If I had to choose between them . . . argh! I couldn’t! I seriously loved writing them both. 4. Do you have any more adventures planned for Dan Forrester? You know how much we all love him. Dan definitely has another exploit or two to undertake. He’s got to sort out his love life! And when he’s approached by a “dead” agent he recruited in Moscow years ago – a beautiful woman he can’t remember – he gets a lot more than he bargained for. 5. Are you a reader? Can you recommend any good books? I am a voracious reader. I’ve just finished The Pale House by Luke McCallin, an incredible war-time thriller with one of the best protagonist’s I’ve met in a long time. I loved Stasi Child by David Young (his first novel) and got blown away by Reginal Hill’s latest The Wood Cutter (his 37th novel). 6. Are you planning on going on a book tour or visiting any of the crime festivals this year? You bet! I’m at CrimeFest in May and Harrogate in July and can’t wait to meet some readers – the whole reason for my existence. Dogs. Just look at the Rottweiler’s in Spare Me The Truth. Cats just couldn’t do the same job. 8. What were you afraid I was going to ask you? As long as you don’t ask me to lie in a box filled with tarantulas, you can ask me pretty much anything!